Few movies about gambling have been made in which the protagonist wins less often than Jim Bennett (Mark Wahlberg) does in “The Gambler,” Rupert Wyatt’s remake of the 1974 film starring a post-“Godfather” James Caan. A calm and collected literature professor, Bennett already owes $240,000 by the time he enters a sleek underground establishment in the opening scene — fictional accounts of gambling’s evils always make the world of high-stakes betting look so cool, don’t they? — and quickly adds to that considerable sum by borrowing a further $50,000 from a gangster named Neville (Michael Kenneth Williams) whose reputation for brutality precedes him. This sets the events in motion for a cooly entertaining countdown narrative (seven days, to be precise) whose stakes rarely feel as life-and-death as they’re meant to. Not that this is always to its detriment. Wyatt, who helmed the unexpectedly solid “Rise of the Planet of the Apes” reboot, directs with less reckless abandon than his protagonist but a similar lack of angst. For all the hundreds of thousands of dollars being thrown around, “The Gambler” is much closer to a friendly game of poker with some loquacious, quick-witted friends than a glimpse at the gambling world’s dark underbelly. Neither is it a preachy moral tale: Bennett is so open about his many shortcomings that there’s hardly a chance for us to judge him, even if we were so inclined. Wahlberg looks as unkempt as possible, his perpetual poker face both a defense mechanism and an accurate representation of his curiously laid-back demeanor. It goes without saying that the various loan sharks’ methods of recuperating their money are said to be sinister but, for a while at least, Bennett seems unfazed. He fancies himself a truth-teller, and his unorthodox lecturing style includes digressions on the nature of excellence: how it’s something innate that a few are born with and many others try fruitlessly to attain. “If you’re not a genius, don’t bother,” he tells his class at the end of a rant that began with a discussion of Shakespeare. He’s exactly the kind of charming, conflicted antihero that Wahlberg has long excelled at playing, and he settles into the role with typical ease. The literary, allusion-heavy passages he and several others sprinkle into conversation are courtesy of “The Departed” scribe William Monahan, whose work here is as smart and punchy as we’ve come to expect — sometimes self-consciously so. (Your mileage may vary with Bennett’s resigned, utterly candid lecturing style; ditto the decision to include Pink Floyd’s “Money” on the soundtrack.) Bennett’s blasé attitude belies the seriousness of his situation: he wants everything or nothing, and is willing to self-destruct in pursuit of it all. Little inquiry is made into the nature of his affinity for games of chance beyond that, and we’re sometimes made to wonder if this is the gambling version of suicide by cop — to come across as so indifferent to the high-powered thugs breathing down his neck that they’ll eventually just put him out of his misery. Even so, Wyatt and Monahan are reluctant to truly raise the stakes until the third act, at which point we’ve lost track of how much Bennett owes to how many parties (and he probably has, too). It’s hard to care that he’s blown the $300,000 his mother (Jessica Lange) gave him to bail him out during a single trip to a Palm Springs Casino, for instance, when he’s so clearly unconcerned by the inevitable development himself. It isn’t until Neville threatens his student/eventual love interest (Brie Larson) that he even attempts to get his act together, at which point “The Gambler” execution finally begin to align with its ambitions. It may not exhibit much genius, but at least it bothers trying. 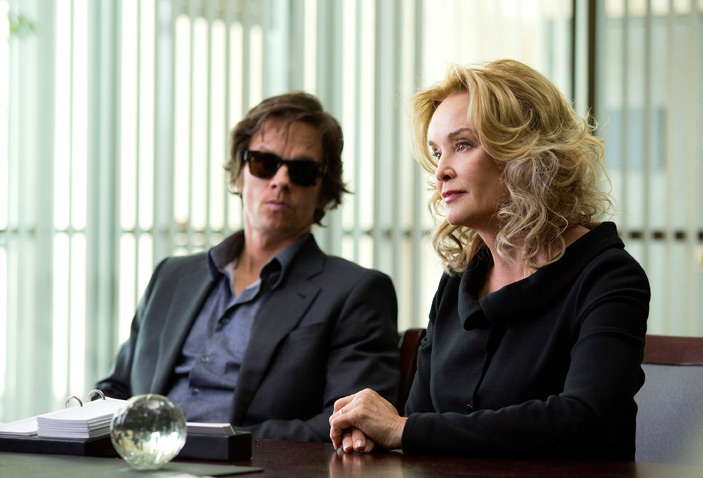 “The Gambler” premiered this week at AFI Fest. It opens in limited release on December 18, followed by a nationwide expansion on January 2.